MPOW is still a somewhat unknown and nondescript company, but a lot of their headphones have topped various Amazon best sellers lists for many months now. 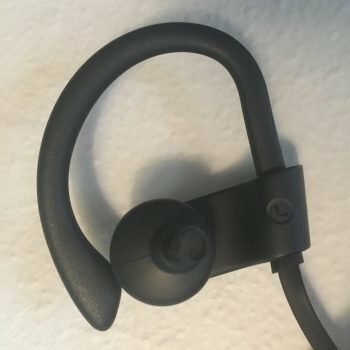 The Flame is an inexpensive pair of wireless earbuds that is actually full immersion IPX7 certified waterproof. Packaging was nice enough – remove the adhesive tape to slide out the box from the cover, which opens up to a nice hard carrying case where the headphones are inside. Also included in the box is a standard micro usb charging cable, a clip to secure the wire to your clothes, a manual, and four different replacement tips. The headphones are a bit bulky, but reasonably light. I was able to get a solid fit with one of the included set of tips, and the over ear hook pad also fit nicely. Basic volume and tracking buttons are built into the top of the right headphone which I actually quite like because they’re always going to be in the same spot rather than having to fish around for something dangling around on the wire. The red MPOW logo on the back of the right headphone below the volume/tracking buttons is also itself a button for pairing and pause/play. The short wire that connects the headphones is a little flimsy but sturdy enough. The Flame does not have a mic nor do they make a version with one to my knowledge. Be aware that these are only usable with Bluetooth and there’s no 3.5 mm jack. Since they’re Bluetooth only they need to be charged first before they can be used, but fully charging them took me less than an hour. After that, pairing them was easy enough and they were ready to roll. The held charge is 7-9 hours which is comparatively OK. 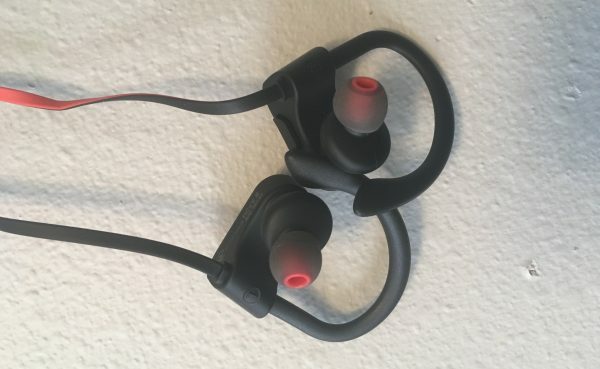 I really wanted to like these because so far everything seemed great, and if they sounded even just decent enough, I’d say an fully waterproof Bluetooth pair of earbuds as cheap as these are would pretty much be a slam dunk. I had decent hopes too since some MPOW headphones I’ve listened to and reviewed sound very solid. But… the sound signature of the Flame was honestly just not that good. These are very bass heavy, and though they’re advertised as such and bass emphasized headphones are often desirable… the lows just sounded muddy. In fact, the whole range just sounded muffled and muddy. Not only were mids/trebles recessed, adequate detail and crispness just wasn’t there – it was as if I was listening to speakers while pushing a pillow against my ears. Bass bleed and resultant distraction was significant. MPOW doesn’t specify a response range but at least the bass extension is there – various drops came in fully even if they didn’t sound very good. These might be passable with edm or hip hop style music where detailed reproduction isn’t as important, but that’s honestly about it I’d say. I will say though that these get nice and loud very easily and have decent noise isolation. The 18 month warranty is also quite good for a fully weatherproof pair of headphones as inexpensive as these are. 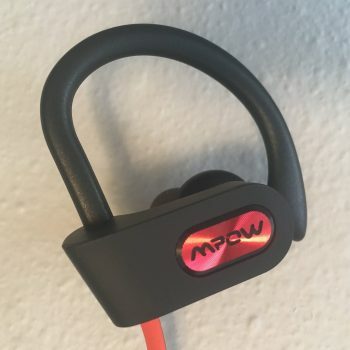 The MPOW Flame is a nice looking, sturdy, and comfortable pair of earbuds that’s fully waterproof to boot, all for a pretty inexpensive price. And while I’d say they’re passable for basic listening, with some types of music at least, they just frankly don’t sound that good, and in a niche that’s now very competitive there are similarly priced alternatives that sound much better, especially if you don’t need something that’s fully waterproof. Update: They’ve released an upgraded version of the Flame, but nothing that might improve the sound has seemed to change – the new model merely has slightly improved waterproofing.